Kualoa – Hōkūleʻa’s visit to the 10th Annual Kualoa/Hakipuʻu Canoe Festival has been suspended. 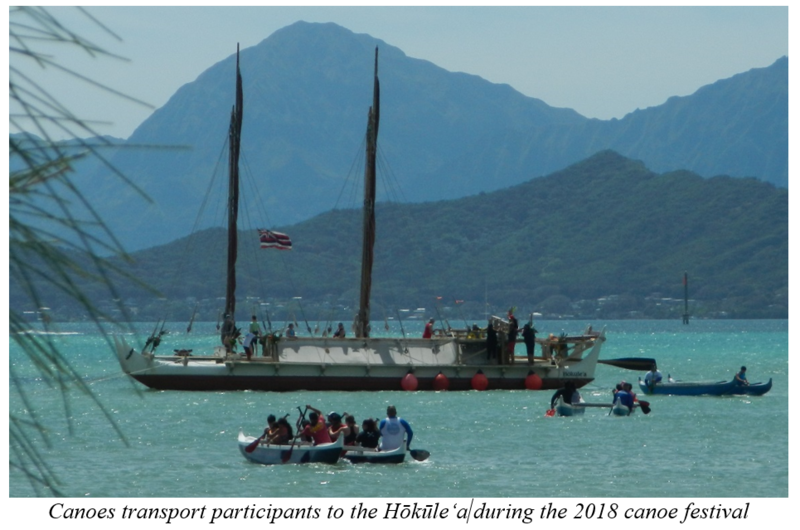 The master navigators of the beloved vessel determined the current weather forecast does not indicate safe marine conditions for the vessel to journey and remain at Kualoa Regional Park for the festival on March 9. According to the National Weather Service, a strong system of high pressure north of the state is expected to deliver increased trade wind speeds this weekend, with additional ocean swells forecast to create choppy marine conditions. The remainder of the activities and demonstrations being offered at the Canoe Festival are scheduled to continue, and the event will have plenty of immersive Hawaiian activities to enjoy. Those include demonstrations aboard the educational voyaging canoe Kanehunamoku, showcases from master canoe builders/paddle makers Bobby Puakea and Nakoa Prejean, the Polynesian Voyaging Society, educational booths, and activities. The event is free and the public is encouraged to attend, with the opening ceremony beginning at 10 a.m. and the festival scheduled to finish at 3 p.m.
Kualoa – Hōkūleʻa is scheduled to return to her birthplace of Kualoa, Saturday, March 9, to highlight the 10th Annual Kualoa/Hakipuʻu Canoe Festival at Kualoa Regional Park. From 10 a.m. to 3 p.m., a decade of celebrating Hawai‘i’s oceangoing traditions will accompany the beloved vessel on the Kāne‘ohe-side of the park. The event is free and open to the public, and all are invited to come and enjoy this immersive Hawaiian cultural experience. Along with bidding Hau‘oli lā Hānau (Happy Birthday) to Hōkūleʻa, the festival will showcase Bobby Puakea and Nakoa Prejean. These master canoe builders and canoe paddle makers will be joined by the Polynesian Voyaging Society, who will be hosting educational booths, activities, and demonstrations aboard the educational voyaging canoe, Kanehunamoku, to share their knowledge. A variety of sailing vessels will also be on display. Be sure to get there early as canoe rides out to Hōkūleʻa will fill up quickly. The attendance of Hōkūleʻa is subject to weather conditions. As a result of the festival, Kualoa Regional Park Campground A will be closed for the camping period beginning on Friday, March 8. Campground B will remain open, however campers should be aware that there will be a significant increase in pedestrian and vehicle traffic. Many thanks to participating organizations: Bobby Puakea and the Puakea Foundation, Hawaiian Ocean Adventure, Kanehunamoku Voyaging Academy, Polynesian Voyaging Society, Hakipu’u Learning Center, Navy Single Sailors, Wounded Warriors, and Calvin Hoe. Since her initial launch from the sacred shores of Kualoa/Hakipuʻu in Kāneʻohe Bay, Oʻahu, on March 8, 1975, Hōkūleʻa has carried the seeds of the Hawaiian Renaissance with her as she traveled throughout the Pacific. This mission continued with her historic circumnavigation voyage, Mālama Honua, beginning in 2013. Four years later, she returned home, completing the voyage at ʻĀina Moana (Magic Island) in Ala Moana Regional Park, where she and her crew were welcomed home by thousands, including Mayor Kirk Caldwell who presented a key to the city. Along the way Hōkūleʻa’s mission to take care of the earth, to live, learn and share a sustainable Hawaiian culture, have gained awareness. In addition to the revitalization of Polynesian voyaging and navigating traditions, Hōkūleʻa introduced the “Promise to Pae ‘Āina” to compel the global community to take up a unified and collaborative approach to environmental challenges that are affecting all of humanity”.